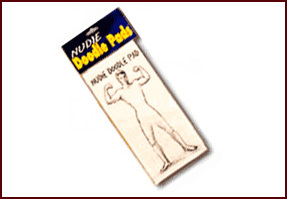 See who has the best drawing and creative skills as you give each bachelorette a sheet of the nudie doodle pad. Each sheet comes with a male hunk that has their male stuff not drawn in. Be creative and create the best willie for the drawing. Color them in and give a bachelorette prize for the best nudie doodle. A fun and easy bachelorette party game to play anywhere. Place the groom's face on the nudie doodle pad that is for the bride-to-be. This item is cheap at only $1.95. A really fun game for the bachelorettes is to get a few Mr. Happy Balloons and dress them up with sticker eyes, noses and mouths. These pink blow ups are a great bachelorette party game to take anywhere. The Mr. Happy Balloon game will get all the girls playing. Take pictures of the best creations and give out rewards for the most creative Mr. Happy Balloon. These kits are only $3.80 which makes them reasonable to get a few and play in groups. There is nothing like throwing rings around a willie! This classic bachelorette game gives you a plastic willie along with color rings to see who has the best aim. Play for shots and move the target further and further away! The bachelorette pecker toss also makes a great decoration after you are finished playing. This is a bachelorette favorite and you will keep all the girls entertained. The bachelorette pecker toss runs around $5.70. 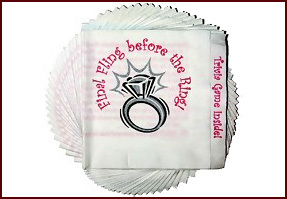 If you enjoy trivia and eating, these bachelorette party trivia napkins will hit the spot. Each package of 25 napkins has a list of questions inside to see who knows the Bachelorette and her Husband-to-Be the best! It makes a great Bachelorette game to play. Examples: "At what age did she or will she, first make 'whoopie'?" "What is the name of her first boyfriend?". These packs of napkins only cost $4.80 and are an excellent bachelorette party game and napkin to actually use during the last night out. Become the protector of the bachelorette by squirting the enemy with the bachelorette super water guns. These willie shaped squirters are a riot and will get a lot of attention. Great for away and outdoor bachelorette parties, not matter where you are. Get one for each bachelorette as they are only $5.29 each. 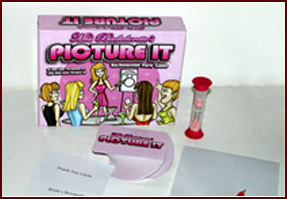 If you enjoy pictionary, then you will love this great bachelorette game that you can play anywhere. Miss Bachelorette Picture It includes cards, a sand timer, pencil and paper. You will be asked questions to draw like Bridal Bouquet, Leg Garter, Thank You Cards, and more as you have bachelorettes guess what you are drawing without saying anything! This game can be played anywhere and everywhere. Break up into teams and have a ball.